Weather has become destabilized around the world. We have new science about risk and the way forward – just released by the Royal Society. From the UK, lead editor Dann Mitchell is our guest. Environmental lawyer Robert Verchick asks: who pays for climate loss and damage made by Western civilization? How much is a country worth? Where will millions and millions of climate refugees go? It’s talk at the highest levels, right here on Radio Ecoshock. Thirty thousand experts, policy people and diplomats are in Poland, planning for the next round of climate talks. They are pushed by a wave of new science warning two degrees is too far beyond safe. Talk of desperate measures to cool planet Earth is coming out of the closet. Scientists like James Hansen have warned the Paris “safe” limit of 2 degrees C warming is not safe at all. The Royal Society just published 20 scientific papers investigating the differences between 1.5 degree warming and 2 degrees. They find that extra half degree could have extreme consequences on everything from the economy to weather. To prevent that last half-degree warming, the project also includes studies of low-emission grids, carbon capture and storage, and even solar geoengineering – blocking the Sun. The editor for this project is Dr. Dann Mitchell from the School of Geographical Sciences at the University of Bristol UK. Dann is also the coordinator for the HAPPI project, which stands for “Half a degree Additional warming, Prognosis and Projected Impacts”. Considering the Paris Climate Accord still accepts a limit of 2 degrees C warming, with 1.5 as an option, the difference is information we all need to know, before it is too late. According to the scientists I interview, our climate situation is alarming. So are some of the paper titles in this new series, talking for example about “uncertainty, urgency and the last gamble possible“. I ask Dann Mitchell where we really stand now. For example, we had an Indian environmental expert say that India is already at 1.5 degrees C warming for 9 month of the year, and went over 2 degrees warming for two months last year. Mitchell says that India has warmed more than the global average, as have other areas, like the Arctic. But the oceans have warmed much more slowly than land, so when we include them, the global mean temperature above pre-industrial levels have warmed only about 1.1 degree C. That still leaves us a short time to attempt to contain warming within 1.5 degrees, rather than going to two degrees and beyond. It just doesn’t feel that way on land. The Paris Climate Accord of 2015 was a bit fuzzy on the goals. They started out thinking 2 degrees would be “safe”. Then there were warnings from scientists that it wasn’t. As I understand it, they set 1.5 degrees C warming as a kind of aspirational goal (we’d like to stay there) but still accepted two degrees warming at the red line for climate safety. But that last .5 degree warming would make a huge difference to our lives! Look how weird and unstable our weather has become at an alleged 1.1 degree global mean warming! Right now, where I live near the West Coast of Canada, we have 250% of the normal snow pack in the mountains (it snowed way beyond anything normal). Winter went long into April, then suddenly switched to hot weather (over 80 degrees F – o over 27 degrees C) at the start of May. The weather switched from winter directly into summer, with no spring. I held off filling my rain barrels until they would not freeze, and then Spring rains did not happen at all. So we have a local river swollen over it’s banks, evacuations and sand-bagging, – and our lot is so dry I had to water our trees. Soil in the garden is dusty, when it should be soaked. Meanwhile the American West is roasting over 100 degrees F (37 C) and very large storms have swept over the central states and up into New England and Eastern Canada – time and again. Strange isn’t it? What could it be? If all that is happening at 1.1 degree of warming, two degrees C of warming is going to be an unpleasant circus, with crop failures, droughts, fires and nasty surprises. That is why this series of papers about demanding 1.5 degree C as the upper safety limit is so important. If we cannot stop using fossil fuels in time, humans may want to use geoengineering. There are a couple of papers in this series about that. The scientists do not advise DOING geoengineering at this time, but do want permission and funding to research how it might work, and what the side effects might be. For example, in this Royal Society series there are two papers on Solar Radiation Management. That means blocking the sun, like pulling a shade over your window. We might blast some sulfuric materials into the upper atmosphere, as volcanoes do when they erupt. Volcanoes have been known to cool the Earth for a year or two after eruption. There can be unintended consequences to Solar Radiation Management, such as possible affecting natural rains in Africa and more. Dann points out that even if we could manage, with heroic efforts, to bring the climate from 2 degrees back to 1.1 degrees C as today – we do not ever get the same climate and ecosystem back again. They whole of nature is so complex that during the process of rise and fall of temperature, the system changes in many ways. Nothing can be brought back to the “normal” we grew up with. 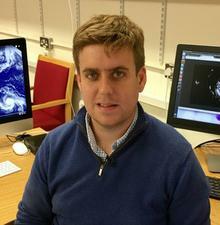 Dan was awarded an Independent Research Fellowship by the UK’s Natural Environment Research Council to, quote, “study the link between the stratosphere and extreme weather at the surface.” Three questions come to mind. First, can climate change, or greenhouse gas emissions, or any other human-made factor – change the stratosphere? Second, what are the relationships between stratospheric change and extreme weather at the surface? Finally on that, when it comes to increasing extreme weather, how important or dangerous is it that we DO NOT KNOW all the relative risks between 1.5 and 2 degrees above pre-industrial? Strangely, for every 1 degree change in warming at the surface, the stratosphere experiences 10 degrees of COOLING. When we create a thermal blanket for the atmosphere with our CO2 emissions, then we hold more solar heat in, and that means less radiations back out to space through the stratosphere. Humans are not just changing the lower atmosphere (the “troposphere) with our carbon emissions. We are also changing the stratosphere. I ask Dann if changes to the stratosphere can affect our weather closer to Earth. One of the papers in this series find that preserving forests could be critical. Overall, the difference in global mean temperature between a well-forested Earth and one where too many trees have been cut down could be .5 degrees – that critical difference between sort-of-safe and downright dangerous climate change. We get a brief introduction to several key papers in this set published in the Philosophical Transaction of the Royal Society from editor Dann Mitchell. We discuss what the world’s climate goals are, and what they should be. The 1.5 degree C limit is a matter of life and death for some Pacific Island nations. Scientists are more and more convinced that above 1.5 C global warming, seas will rise high enough to put those islands under water most of the time. All the inhabitants would have to leave. Australia and New Zealand are in discussions to take some of those people. But how can we value the country where all our previous generations lived, our stories and cultures lived? That one subject for our next interview, with environmental lawyer Robert Verchick. Dr. ROBERT VERCHICK – CAN “HEROIC MEASURES” SUCCEED? When extreme storms, fires, or crop failure devastate the poorest people in the world, will anybody save them? The richest countries polluted the atmosphere with climate-changing gases. Who will pay how much for what, and how? Since hardly anyone in public media is talking about this, we will. 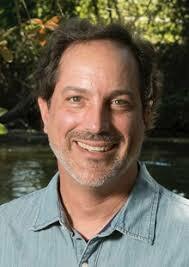 Robert Verchick is the Gauthier-St. Martin Chair in Environmental Law at Loyola University in New Orleans. But Dr. Verchick is on loan to Yale, as a Visiting Professor to the Yale Law School. I have problems of my own. Based on about two hundred interviews I’ve done with climate scientists, my guess is that Earth will warm 3 or 4 degrees by the year 2100. At 4 degrees, the global economy will likely collapse, and no one will be compensated or treated fairly. Doesn’t this whole venture of loss and damage depend on an economy functioning somewhat like the present? If a climate-driven collapse occurs, or an economic collapse for any other reason, then I guess the whole plan to help the victims of our fossil emissions will go bust too. Nobody helps anyone. While international negotiators are working through a long process to set up a fund, and get any payments into it – we are already seeing hurricanes rip through Caribbean Island nations, plus mega-cyclones in the Philippines and Pacific Island nations. After the initial Red Cross aid and a little TV fundraising, there hasn’t been much help. Is it possible events will overwhelm country after country before we have any plan to respond? What if I say there isn’t enough money in the world to replace the developing losses. How do we value a country lost, where ancestors lived and all stories are based? Who will pay to “rebuild” or “replace” a flooded Shanghai, New York, or Tokyo? Are world bodies discussing this? Suppose most of Bangladesh floods, and stays flooded. There are 166 million people there. Where will they go? Who pays for all that? Obviously it is better to try to do something than to do nothing. If a more realistic climate reparations system is established, who will administer the large amounts of money, and who will oversee that system to reduce corruption? We know that as climate change develops, there will be millions, perhaps hundreds of millions, of environmental refugees. Their lands may go under rising seas, be demolished by repeated violent storms, or just too hot for agriculture or survival. Currently, Verchick tells us, we have laws in many countries to allow political refugees to apply for entry. But there is no legislation for environmental refugees. In this interview with Rob Verchick, you will hear what is being done so far, and what we really need to do to prepare, or at least adapt to developing “loss and damage” from climate change. Next week, we’ll hear how fracking for gas killed the safe way out. And Rob Hopkins, the co-founder of the Transition Town movement makes a personal transition. Be sure to join in, for the next global broadcast of Radio Ecoshock. If you can afford it, please help me keep Radio Ecoshock going. Your one-time donation, or monthly scheduled donation, keeps this program playing on 100 non-profit radio stations. Find out how here. I appreciate your help so much.